Today, @CNNLightYears is giving a #FollowFriday to Twitter accounts that tweet about the study and conservation of the ocean. The ocean covers 71% of Earth's surface and contains 97% of Earth's water, yet more than 95% of it remains unexplored, according to the National Oceanic and Atmospheric Administration (NOAA). NOAA is a scientific agency with the mission to "understand and predict changes in climate, weather, oceans, and coasts," according to its website. Follow NOAA for ocean discoveries and studies, such as the finding of hydrothermal vents in the Galapagos. NOAA's National Ocean Service is responsible for preserving U.S. coasts, oceans, and ecosystems. 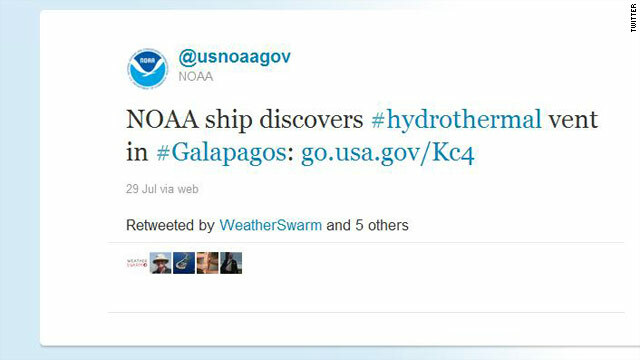 NOS tweets agency updates about the ocean and coasts, as well as images of marine life. The National Marine Sanctuary System tweets about marine life and habitats, as well as the effort to conserve the ocean and coasts. The National Marine Life Center rehabilitates stranded sea turtles, seals, dolphins, porpoises, whales, and other marine life. Follow @MarineLifeCtr for updates on these rescued creatures, as well as links to other rescue blogs. The Ocean Conservancy works to promote a healthy, diverse ocean, as well as to stop practices that harm it. Check out #WallpaperWednesday for a weekly and downloadable image of a sea creature.